A girl from Brazil has expressed ‘regret’ after forcing a doll’s eye into her own eye socket. Maybe look away about now if you’re in any way squeamish about eyes… Or maybe even if you just have eyes. 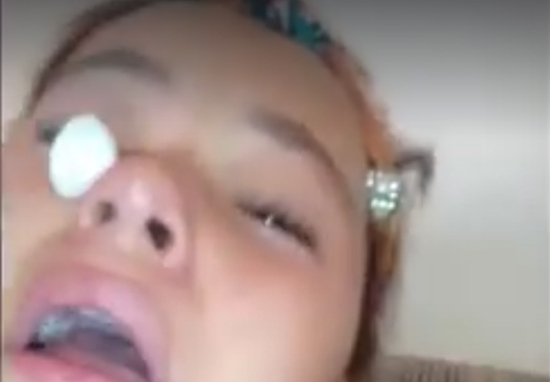 A video has gone viral that shows a girl in tears of panic as she desperately tries to remove a doll’s eye from her own eye socket, after she deliberately pushed it in there herself. The girl, who has not been named, is said to have been motivated by wanting to have bright blue eyes. However, once she had wedged the sizeable piece of plastic under her eyelids, panic started to set it. The squirm inducing footage shows the girl and her mum fiddling with the creepy, blankly staring eye to get it to budge. Finally, the eye is pulled free and the girl is shown sobbing on the sofa. Bad idea for child to put in a doll eye. Look what happened to my daughter. Ideia errada de criança colocar olho de boneca ,olha o q aconteceu com minha filha. .
At the time of writing, the original video has been viewed 6.2 million times, with a mixture of horror and amusement. Some viewers just cant stop laughing whereas others just can’t believe their own eyes. Luckily, the girl is now okay after her risky and painful beauty experiment. However, this might have had some pretty serious consequences and could even have left her blind.